Smartphone usage has penetrated deep into the society with almost 2.5 billion users worldwide. As of 2017, there are 224.3 million smartphone users in the US. Sadly, the addiction is not limited to the adult section of the population though. It has sneaked its way into the youngest members of the society. According to the Center for Disease Control and Prevention, screen time has soared up to almost six hours in a day. During this time, kids that get glued to their screens miss out on crucial physical activity. The pros and cons that weigh the usefulness of a smartphone are a matter that still sits on the debating dais. The factor that is far more urgent than this, however, is that even toddlers are increasingly becoming interested in smartphones. This vastly increasing trend in toddlers is leaving serious impacts on their brain development. The soft glow of the screen is a major enticing factor in attracting toddlers to handheld devices. Naturally, something that has their parents’ attention arrested piques their curiosity significantly. As adults, it is often onerous to quit the consistent scrolling and phone-checking in a day. This is because smartphone apps have been developed by geniuses who understand the entire dynamics of brain habits. Hence, each application is designed by interlacing its mechanism in ways that trigger behavioral addictions of the mind. He also adds, “So if you put something shiny and interesting in front of them, they will gravitate towards that even to their detriment.” Cellphone use among preschoolers doesn’t need any further elaboration, but its impacts need to be entirely dug out. A braintest wouldn’t tell yet, but smartphone exposure riddles with numerous effects on the tiny tot’s brain. The implications can be pictured more clearly by comprehending that developers of this technology don’t allow their infants near it. In fact, the Waldorf School of the Peninsula helps meet their needs where children of Silicon Valley executives study. It is the tech-free school that restricts the use of technology altogether, making space solely for creativity. A toddler’s brain grows three times in size between the age bracket of 0-2. Agents such as parents’ touch, voice, and gradual play, guide him constantly in his young mind’s learning journey. Such learning directly correlates with an infant’s brain development in the form of building neural pathways. These pathways assist a child’s learning and his emotional bonding with other people. However, the picture isn’t as smooth as this when smartphone interaction jumps on the bandwagon. The neural pathways of such kids change, and different ones than these take their stead. These new neural pathways which are a product of smartphone usage, affect a child’s self-esteem and concentration. In several cases, young ones fail to develop deep emotional relationships too as explained by Denise Daniels, a pediatric nurse. Little ones learn by observing everything that goes around them. In essence, imitating their parents is a crucial tool in their learning arsenal. Daily discovery aids in the way they make sense of the world around them. To this end, face to face interaction with parents is the prime source of learning new things. Screen time, however, stands as an obstacle that prevents this essential learning and world exploration. Play and parental interactions take a toll as smartphones prevent both, occupying both parties in the equation. 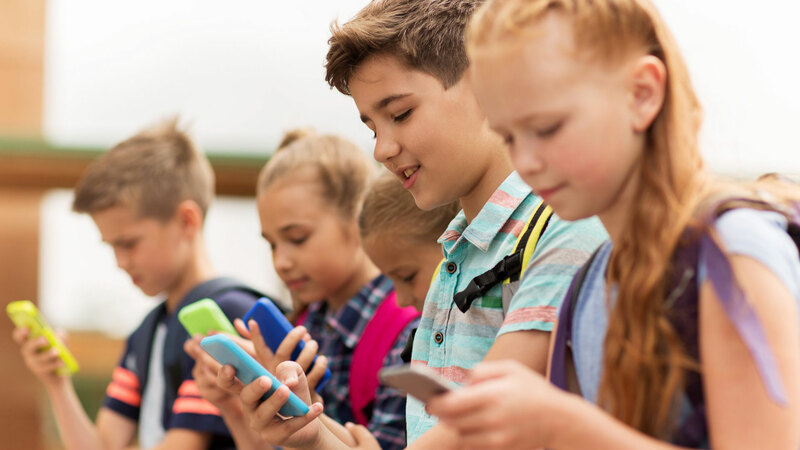 Dr. Jenny Radesky of Boston Medical Center opines that smartphones are cutting down the parent-child interaction by tuning down parental attention. She elaborates that the children, their early ages, learn the language, emotions, and their emotional regulation. They learn these things by observing their parents and caregivers talk and converse with each. They also learn from parents about recognition of facial expressions. However, if that is not happening, numerous essential developmental milestones are being missed out upon. 7 out of 10 parents with tablets in their house allow their kids to play with the gadget. 97% of the US toddlers under the age of 4 operate smartphones. Moreover, researchers from the University of Iowa revealed that 90% of the present-day kids exhibit a moderate ability to run a tablet. These staggering figures only confirm that cellphone use amps up the odds of infants developing a poor sense of self-regulation. Evidence backs this up, as a study highlights that screen time engagement influences the tot’s interactive behavior and self-regulation. Another research shows that infants between 18-36 months become highly absorbed in electronic devices. They barely responded when their names were called in the experiment. This was when children were handed iPads in the study. When the same lot of kids were engrossed in device-free plays, they showed enhanced creative and social behavior. Research indicates that infants aged 2 and below use their senses in the quest of world exploration. These senses also help them in interacting with fellow kids and adults. Hands-on activities and social play assists in developing their emotional and sensorimotor skills. The social play also encourages the development of problem-solving skills and imagination among toddlers. Smartphones and other electronic devices impede social and emotional development. The impact is detrimental even if such gadgets are handed to the preschooler as a distraction to calm him down. This, again, retards the self-regulation mechanism among toddlers. Enhanced screen time for the little champs also leaves poor effects on developing their skills that are necessary for science and mathematics. This occurs as smartphone use forestalls the development of visual-motor skills that are critical for the application of science and math. Reports are also linking the use of cell phones with delayed speech development. Children who spend a notable amount of time with handheld devices are at risk of expressive language delay. Researchers have uncovered that every 30 minutes of screen time bogs down speech development by 49%. Sleep is precious for a baby’s early years, as it helps in brain development. The use of touchscreen devices also corresponds with sleep disruption in rug rats. A study found out that an hour of screen time subtracted 16 minutes from the child’s sleep. The study also outlined that 75% of infants between the ages of 6 months and 3 years used smart devices daily. The use of touchscreen swelled from 51% among 6-11 months old babies to 92% between 25-36 month-old infants. Increased cell phone use can also culminate in hyperactivity among toddlers. Summing up, the effects of smartphones on toddlers are numerous. These include receded brain development, delayed communication, and lessened sleep to name a few. Have Smartphones Destroyed a Generation? The Price of Progress!